24Option.com started off in 2009 as one of the first online retail binary option brokers, and they recently expanded into offering an online brokerage service for forex and CFD traders. The brand now has a product line that now encompasses forex currency pairs; stock, commodity and index CFDs; and binary options on a wide range of underlying assets. In Europe, 24Option is operated by Rodeler Limited that is regulated by CySEC with CIF license number 207/13. Elsewhere in the world, 24Option is operated by Richfield Capital Limited that is regulated by the IFSC in Belize under the license number IFSC/60/440/TS/17. Please note that 24Option.com does not currently accept U.S. clients. If you are located in the United States, you will want to select another broker. In addition to being able to trade in the forex and binary options markets, the 24Option trading platform offers traders the capability to execute commodities, and CFDs on major stocks and market indexes all from a straightforward Web based interface. Experienced traders used to MetaTrader4, and especially those looking to use its Expert Advisor feature, will also be pleased to know that 24Option supports this popular trading software. 24Option.com charges no commissions on transactions its clients execute using their brokerage service. Instead, the company earns money from the dealing spreads, which are quite competitive and range from a minimum of three pips for the majors to around seven pips for exotic currency pairs. Leverage of up to 200 to 1 is available for most forex transactions. Basic – requires a minimum deposit of at least $250, £250, €250, ¥25,000 or RUB 10,000. This account type has minimum forex dealing spreads of three pips for major currency pairs, four pips for minors, and seven pips for exotics. Traders using this account type can employ either MT4 or the company’s proprietary mobile and web-based trading platforms. They also get 24/7 access to customer service. Silver – requires a minimum deposit of at least $2,000. Silver accounts have all of the Basic Account features, as well as providing access to Trading Alerts plus a Personal Trading Coach. Gold – requires a minimum deposit of at least $25,000. Gold accounts have all the Silver account features, as well as giving access to email and SMS alerts. Also, Gold account traders get an extra return of 2 percent on each trade they execute. Platinum – requires a minimum deposit of at least $50,000. Platinum accounts have all the Gold account features, as well as allowing access to a useful market research website plus a Live Training Session. Also, Platinum account traders get an extra return of 4 percent on each trade they execute. Diamond – this account type does not have a specific minimum deposit, but it does needs to be approved by an account manager. It includes all Gold account features, in addition to free tickets to Juventus FC soccer matches in Europe plus access to a trading platform that can be customized. Islamic – this account type does not pay interest and so does not conflict with the Islamic Riba prohibition. All 24Option account types can be Islamic accounts. Traders can make initial deposits to fund an account at 24Option using a Visa, MasterCard or Discover credit card and with debit cards or a bank wire transfer. 24Option unfortunately does not accept PayPal electronic transfers, although they do accept those from Skrill (formerly known as Moneybookers), Qiwi, UCash, Neteller, Sofort, PaySafe and WebMoney, among others. Opening a trading account with 24Option requires a minimum initial deposit of roughly $250 and a minimum $24 trade amount. The minimum deposits for credit and debit cards and for electronic payments are $250, €250, £250, ¥50,000 and RUB 10,000, depending on the currency you choose to use. Minimum deposit amounts for bank wires are $1,000, £1,000, €1,000 and ¥100,000. The maximum deposit sizes for credit cards are 10,000 Euros, 10,000 Sterling, 10,000 U.S. Dollars and 100,000 Yen per day. The maximum deposit amount per month is 40,000 Euros, 40,000 Sterling, 40,000 U.S. Dollars or 4,000,000 Yen. Withdrawals from a 24Option.com account require that the customer present an official photo ID and proof of residence like a utility bill. You will also need to provide copies or photos of the front and back of your credit or debit card if you wish to use it as a withdrawal method. The withdrawal fees for the Basic, Silver and Gold account types are: 3.5 percent for credit and debit card withdrawals; fees of $30, €25, £20 or ¥3,000 for bank wire transfers; and 2 percent for Skrill or 3.5 percent for Neteller. Gold account holders get a free withdrawal each month, and Platinum and Diamond account holders do not have to pay withdrawal fees. Withdrawal requests are processed during the Cypriot business day from 9am to 4pm on Monday through Thursday and from 9am to 1:30pm on Friday. The Web based 24Option trading platform has recently been upgraded to let clients deal currency pairs, binary options, CFDs and commodities from the same easy to use online interface. Take a look at the screenshot below to get a sense for the substantial functionality of this trading platform, which includes account management, market monitoring, trading and technical analysis capabilities. 24Option also lets its interested clients use MetaTrader4, which is the world’s most popular online trading platform for forex trading. Not only are many Expert Advisors available to run on this platform that can automate trading and provide trading signals, but the software is available free of charge from its developer’s website. Finally, 24Option provides a mobile trading platform and account management app that can be accessed on cell phones and other smart devices running either the Android or iOS operating systems. 24Option has its customer support staff available on a 24/7 basis to provide, phone, email and Live Chat support in multiple languages. In addition, their trading platform has been translated into 22 different languages for the convenience of global traders. 24Option.com has various forms of educational material available for clients of novice, intermediate and advanced skill levels that include webinars, news and interactive eBooks. In addition, the Trading Central service lets clients access third party market analysis, as well as historical data. 24Option.com is regulated by CySEC in the European Union and IFSC in Belize, which gives traders the security that their funds are safe with this broker. The broker claims on its website that it segregates and insures client funds, and that it protects sensitive client information with multiple firewalls. 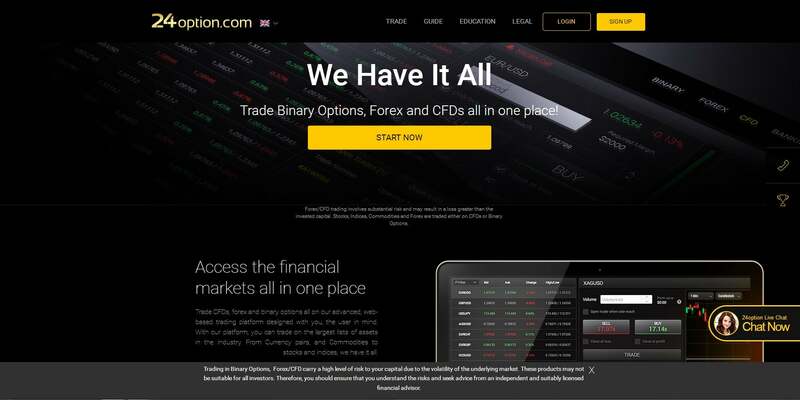 24Option.com seems like a decent online broker choice for both beginning and seasoned forex traders, especially if they are interested in trading binary options or CFDs on underlying assets in other markets. Furthermore, their in house trading platform has an easy to use interface, and a mobile option and support for MT4 is also available. On the downside, they have a rather high initial deposit of $250 and a low leverage ratio of 200 to1 for forex trades. Also, while they do not accept PayPal, numerous other electronic deposit methods are acceptable to them, in addition to debit and credit cards and bank transfers. ForexIndicators.net is not only the best resource for all things indicators. We also bring you the most comprehensive forex broker reviews. We have reviewed the top forex brokers on the market today and come up with a list of select few. All the brokers are regulated and offer competitive trading services on state of the art trading platforms. Have a look at our forex broker list. The stochastics indicator is one of the oldest analytical tools in the market and its great advantage is its simplicity. But what is the best way of using it, and what pitfalls should you avoid.